Lindsay's Book Chat: When should a heroine tell lies? When should a heroine tell lies? When is it OK for a heroine to lie? In my latest, "A Knight's Prize" my heroine, Edith, is a liar. She lies to save herself and her fellow-villagers. She makes an illusion in order to survive. Does that make her evil? To me it does not. But heroines in romantic fiction tend to have less leeway than heroes. Take a hero who sows his wild oats. That is seen as normal, possibly even considerate, as he will then be experienced when making love to the virginal heroine. But how many hearts has he broken on the way? Take a hero who is driven, obsessed, vengeful. 'Yum yum! ', perhaps, is the response of some romance readers. But I wonder what happens when that engine of revenge is spent. What then? And if the hero is obsessed will he not remain obsessive? That energy, once he and the heroine are together, may be diverted into other things. He will no longer be a driven lover, but what? Can the truly vengeful have a happy ever after ending? What of the heroine who is driven and ambitious? Why is that seen as something to be diluted in her but not in the hero? As a romance writer, I love a happy ever after end. To ensure it I look forward into my characters' lives, projecting them far into their futures. Will they still be content in old age? Will their different characteristics still mesh? When couples remain and stay together they tend to end any disputes with tolerance and laughter, a mutual appreciation and understanding. This is what I like to show in my romances - the start of that process. 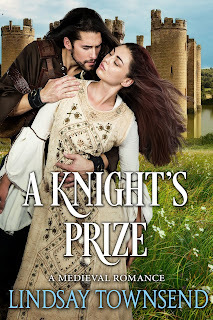 So, as A Knight's Prize progresses, Edith realizes she can tell Ranulf the truth. That trust from her is vital. Ranulf also realizes that his grief for his late wife is also laced by guilt and resentment that he needs to lose. Edith accepts him and realizes he believes more in the church than she does. She respects that, even as she begins to question her own hard-headed, practical way of always looking at the world. Ranulf accepts that she told lies and accepts why she did so. He forgives her - though to Edith he has nothing to forgive. I'm with Edith. How about you?